I have a confession to make: I don’t do any open water swim training and do not even like it that much either as a way to train (for me). Reduce or eliminate fear or anxiety. This is a big one. If swimming in open water makes you nervous, you need to go out and do it. By getting comfortable in open water it will make race day that much less intimidating and will allow you to focus on the things you can control, like your effort, technique sighting, etc. Because you LOVE IT and it is FUN. This is #1 for me. If you love swimming in open water and it means you will actually go out and swim, then head right on down to the water and jump in. While demanding, sports are meant to be enjoyed, and if you love swimming in a lake or ocean—skip the pool. We have a few AP racing team athletes who train exclusively in open waterbecause we know they wouldn’t swim if they had to hit the pool. 1. You are a swimmer. When you are in the pool, you are a swimmer. Period. That means you need to behave like one. This means knowing how to use a pace clock (no watches in the pool when I train), understanding what a base interval is, doing flip turnsand how to swim a proper swim set. If you walk like a swimmer and talk like a duck, you are a duck—be a swimmer. Your workouts should be structured and include a warm up, pre-set (to prime your body), main set, drill set and cool down. 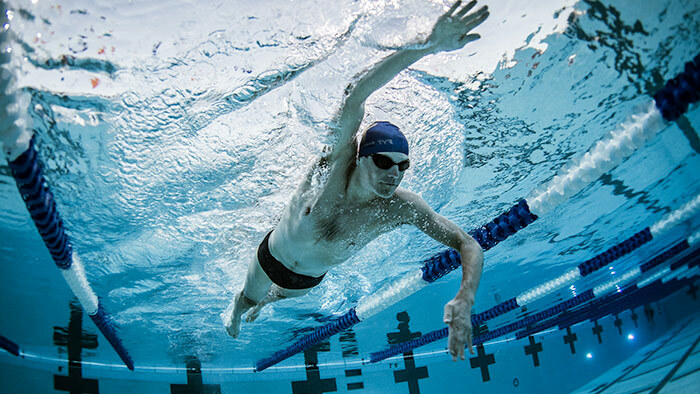 It is critical to swim both aerobic and anaerobic types of swim sets (they are not mutually exclusive). 3. Warm Up. Warm up. Warm up. When it comes to race day, make sure you get in at least 15 to 35 minutes of warm up in the water prior to the start. The colder the water is, the longer you need. A lot of our athletes talk about shortness of breath during the first parts of a swim. This can be avoided by getting in a really solid warm up. Prior to a race, I like to swim a warm up that is similar to my pool warm up. Something such as: 10 minutes slow build (effort), five to 10 minutes of stroke, kick and swim work, and then five to 10 minutes of 30 second to 1.5 minute efforts with easy swimming or floating in between. Use this time as a way to quiet your mind and focus it on the day ahead. This is a common piece of advice across disciplines in training and racing that we talk about a lot with our AP racing athletes: You want to build your effort throughout the day. Think of your effort level as an elevator that is slowly rising up through each floor of a building. We are not shooting to the top but climbing up gradually. You will feel much stronger, less anxious and have a better day as you are going by all of the folks that started out too fast. 5. Use Buoys like Walls. I like to use the buoys as a reminder to increase my speed/effort, focus on my stroke, check my hand position or whatever other cues you might need. As you approach a buoy, give yourself something to focus on until the next buoy, it will keep your mind focused and help you stay engaged throughout the swim. Why should you sight less? Well, most of the courses are pretty straight forward, there are typically people, kayaks or bubbles to follow, and by sighting so much you could be taking yourself off-course more. 7. Wetsuit Swim. Soak your wetsuit. If you have not worn your wetsuit in a while or you are wearing it for the first time, soak it in your tub or a bucket. By soaking your wetsuit, it allows water to get into the pores of the suit and actually helps loosen it up a bit. It’ll be that much more comfortable when you put it on. Now that we laid some of the basic groundwork and you are at race week, here is a sample race week swim program and how we could adapt it for open water swim training if you do not have access to a pool. This training weeks assumes this is your “A” race and that you will not be “training through” the event. Stay fresh and don’t get stale. Rev your engine all week. Be comfortable in the water and ready for race day. Now, get out there and jump right in! Click below to view Andy’s Race Week Swim Plan. Andy Potts is an Olympian, 70.3 World Champion, Ironman Champion, father and husband. Both on and off the race course, Andy leads from the front. During his career he has amassed over 75 victories, 28 Ironman 70.3 1st place finishes and 8 Ironman victories. Andy’s team, AP Racing, was founded in 2015 to provide athletes with custom coaching solutions, a nationwide community and pro level sponsor support. Find out more about Andy and the AP Racing Team at www.andypottsracing.com.